In Canada the Sears Department Stores still give out free for the asking the Christmas Wish Book catalog. I pickup my catalog each September to look at all the decorations and toys that are available during the holiday season. The Christmas catalog has and continues to be the avenue for boys and girls to peruse and then make lists for Santa Claus to find for toys wanted to be found under the tree. Almost every child has wanted to see a sled under the tree. Then to hope for snow to put the sled through its paces. Store issued catalogs have been on a decline for many years due to several factors; the cost of the catalog, internet shopping and buyers living in areas close to large stores. In years gone by catalogs were issued by Sears and Roebuck, Montgomery Ward, J.C. Penny, and even local hardware stores. In many rural areas the local hardware store became Santa's Toyland during the Christmas season. One item that appeared at some point on almost every child's Christmas wish list was for a sled. Even today sleds may be made of plastic or have different shapes, but a sled is still a hot item. The thrill and excitement of flying down a hill low to the ground with the snow coming up to greet your face. "But just fore Christmas I'm as good as I kin be! The earliest sleds found in New England and Midwest U.S.A. were made of wood and came in various sizes. Sizes could range from 12"-52" or even longer for whole groups to slide down the slopes on. By the 1850's some sleds were appearing on the market with metal runners. 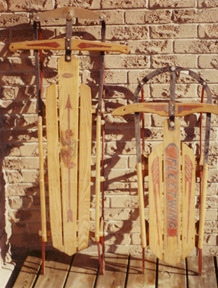 The metal runners lasted longer than wood and gave the sled a easier gliding motion. The first major manufacture of sleds was the Paris Manufacturing Corporation of South Paris, Maine. It was founded by Henry F. Morton in 1861. The sleds were hand painted by his wife and the sleds did not have a steering control. The sleds sell for several hundred dollars due to the hand painted nature. Oak was employed as it is a hard wood. A sled has to take a great deal of weight usually by the individual jumping onto it. A sled appeared in the 1870's Montgomery Ward catalog. One model even had a ornamental swan on the front. There was a sled for each price range - 60 cents to $1.15 for the most deluxe. It was during this time that one interesting company did appear, the E. Bassingdale Garton Company of Sheboygan, Wisconsin. For the pedal car collector the name will ring many bells. The Garton Company in the 20th Century became one of the major manufactures of pedal cars for children. Today a Garton pedal car of any type is sought by collectors to add to their collection. 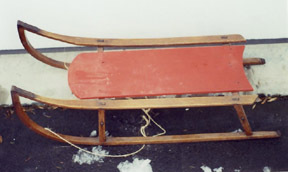 Sleds came in many styles from plain wood to painted animals or figures on the body of the sled. There was even a special sled for girls which was smaller and lighter. Some sleds had names on the body - Snow Flake, Yankee Clipper, Devil, American Racer, Canadian Racer. Colors were bright in many instances the hot color of red being the favorite. Sleds were usually made of three planks of wood with a set of handlebars to grab on and steer with. Many sleds had decals or decorations on the body and some on the handlebars, as well. Of course the most famous American sled is the "Flexible Flyer." 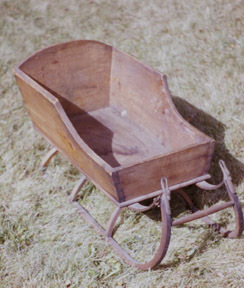 The sled was the idea of a Pennsylvania Quaker farmer Samuel Leeds Allen. He operated a farm equipment manufacturing business in the 1880's. He found the business was a success, but was of a seasonal nature. Allen began to think and search for another item that could be manufactured in the off season. A product that could be sold in the winter. Sleds were being manufactured by individuals - Allen hit upon the idea of mass production. In addition at this time mass produced items were becoming a status symbol since for whatever reason a higher value was being placed upon manufactured goods. In another event that would demonstrate that manufacturing was becoming more sophisticated he tested his design on different models on a farm in New Jersey. In 1889 he applied to the US Patent Office for his design. The sled rode on a single pair of steel runners and very importantly had a hinged attachment near the center that steered and controlled the direction of the sled. By turning the handlebars and shifting ones body or weight on the base of the sled it could be coxed into a different direction. But, he was ahead of his time. The sled did not sell. The sleds that contained to find their place in the Christmas market were still the heavier unsteerable sleds. The major manufacturer was Paris Manufacturing of South Paris, Maine. It was not until after the Sears catalog of 1908 featured several different types of sleds made of hardwood and having good spring runners that the "Flexible Flyer" made a return. The sleds sold by Sears went for 91 cents and were 30" long. In 1913 the "Flexible Flyer" that we think of made it into the stores. It was 56" long and had a large red arrow on the wood frame. The "Red Arrow" became the famous trademark. Allen now convinced two large department stores to stock and sell his sleds especially during the Christmas season. R.H. Macy's New York City and John Wanamaker of Philadelphia. 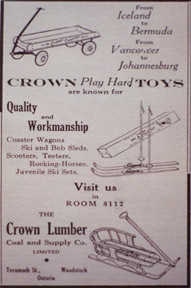 By 1915 the "Flexible Flyer" was selling 2,000 sleds a day. With the steering mechanism the safety issue for children and taking the worry away from parents was being focused on as a major selling point. By the 1920's Sears was offering the "Flying Arrow" - "Watch it fly around corner, these sleds actually steer, runners are highly tempered spring steel, they carve up abruptly in front which leaves more of the long runner on the ground, making it easier to steer and giving a better coasting surface." The price $2.87. By the 1930's improvements were being made, the steer was easier and could move the sled in different directions easier. Just like an automobile that undergoes testing and adjustment through the years the sled was no different. Sales skyrocketed in the 1930's and the item became even more popular due to the character that began to appear on the sled. In an agreement with Walt Disney - a decal of Mickey and Minnie Mouse began to appear on sleds. Once World War II was over the Baby Boomers began to appear on the scene in record numbers - the sales of "Flexible Flyers" took off. Wherever there was the chance for snow, the item on the Christmas list was for a sled. In the 1960's Allen's "Flexible Flyer" company had been purchased by a firm that manufactured outdoor swing sets. Some sled models were manufactured in aluminum only now. There appeared the "Saucer Sled" and even to go along with the hit Bat Man television show of the period - "Batwing sled." The sled was in the shape of a Bat wing. Today sleds have come full circle -in the 1800's wood and no steering -wood and metal with controls - to metal and no control today. The "Flexible Flyer" has passed into history since the company changed owners several times since the late 1960's. Sleds have appeared in many movies through the years. Probably the two most famous were; 1941 - Citizen Kane with Orson Wells. The movie opens with Kane's last words - Rosebud. In fact, the central core of the movie focuses on what did those words "Rosebud" mean and what did they relate too. What was Kane trying to convey as he dropped the snow globe and uttered those words. Of course as the movie went on the audience came to know the secret that he was his child-hood sled. The memories of good times with the sled although he was poor was the message being conveyed. In the end the audience witnesses the sled being tossed into the giant furnace along with other objects of value and the last words remain a mystery - innocence of a child with his red sled gone forever. The Rosebud sled from the movie was sold at auction years ago. The auction was held in New York City and the buyer was Steven Spielberg -the price was $60,500. The interesting note is that there were actually three Rosebud sleds, but the other two were really burned in the making of the motion picture. The more recent 1993 Ethan Hawk starring Liam Neeson based on the Edith Wharton's book of tragedy, repression and irony. Set in rural New England an accident with Neeson hit-ting a tree with his sled sets the tone of the movie. The sled demonstrated the danger of the early sleds that did not have steering or controlling mechanism. 1. In 1910 "Flexible Flyer" introduced a "Tuxedo Racer Model" - in honor of the Tuxedo Club in New York City - it was a major spot for sledding. 2. 1913 - "Flexible Flyer" red arrow trademark introduced. 3. 1940s - the baby sled back was introduced. The wrap around wood piece was to keep a baby from falling from the sled. Also a handle was added to the front of the sled so the baby could be pulled. 4. 1940 "Flexible Flyer" straight runner models phased out. 5. A "Flexible Flyer" sled rests in the Smithsonian Institute in Washington, D.C. It will remain on display forever as a part of American history. Flexible Flyers and other Great Sleds - 1997 - published by Shiffer Publishing.